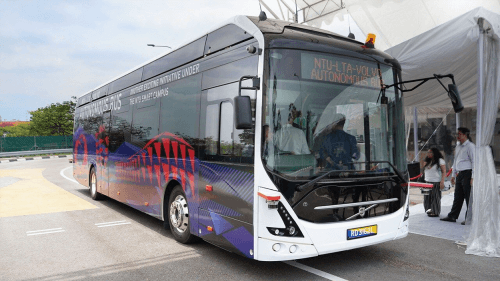 Volvo Buses and Nanyang Technological University (NTU) in Singapore have demonstrated the world’s first 12m autonomous electric bus. The bus will soon begin trials on the NTU campus. The 85 passenger-capacity Volvo 7900e is equipped with sensors and navigation controls that are managed by a comprehensive artificial intelligence (AI) system. This includes light detection and ranging sensors (LIDARS), 360-degree cameras and an advanced global navigation satellite system that uses real-time kinematics. This is like any global positioning system (GPS), but uses multiple data sources to give pin-point location accuracy up to one centimetre. The system is hooked-up to an ‘inertial management unit,’ measuring the bus’s lateral and angular rate. This will improve the bus’s navigation when going over uneven terrain, ensuring a smooth ride. Ensuring maximum safety and reliability, the AI system is also protected with cyber security measures to prevent unwanted intrusions. The bus has undergone preliminary testing at the Centre of Excellence for Testing and Research of Autonomous vehicles (CETRAN). Plans are in place to test it on the NTU campus and to extend the route beyond the university. This is Volvo’s first autonomous fully-electric bus in public transportation. Håkan Agnevall, President Volvo Buses, said: “Our electric bus featuring autonomous technology represents an important step towards our vision for a cleaner, safer and smarter city.